Gazing up through the 31-foot oculus lens into the Gulf Stream Aquarium gives you an unmatched view of one of the world’s most powerful ocean currents on the planet, home to one of the ocean’s apex predators: sharks. In honor of the Discovery Channel’s Shark Week celebrating 30 years on air, we’re counting down our top five favorite shark facts. Our very own Andy Dehart, Vice President of Animal Husbandry and Marine Conversation, is a shark expert and has been featured in numerous Shark Week productions on the Discovery Channel as a Shark Advisor. There are over 400 species of sharks in the world. Sounds like a lot? Well, there’s nine different species of hammerheads alone! At Frost Science, our Gulf Stream Aquarium is home to scalloped hammerhead sharks. Sharks have quite the range, but more than half of all shark species will never be larger than three feet long. The largest shark? That’s the whale shark, they can reach lengths of up to 40 feet! On the other end of the scale, dwarf lantern sharks only get as big as eight inches. Did Jaws scare you? This should ease your fears… Shark bites are actually rare, there’s less than 100 shark bites reported globally each year. Of those bites, only about five are fatal. Sharks should fear us far more than we should fear them. Annually, humans are responsible for the deaths of over 73 million sharks across the globe. That’s about 200,000 sharks per day, or 8,333 per hour. The main culprits? Targeted fishing of sharks and bycatch, where sharks get trapped while other seafood is being fished. Shark skin is actually covered in dermal denticles. Instead of resembling fish scales, sharks have what more closely resembles modified teeth. The silky sharks in our Gulf Stream Aquarium stand out for more than just their beauty—they got their name because their skin is significantly smoother than other shark species. Despite their power, sharks are no match for humans. 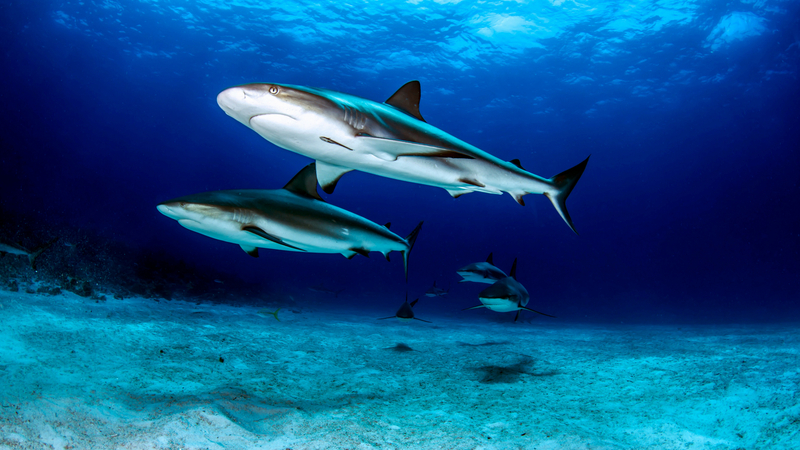 Sharks are slow to mature and have fewer offspring than other commercial fish like tuna, snapper or grouper. Visit Frost Science to learn more about sharks, and the work we’re doing to ensure they are protected.